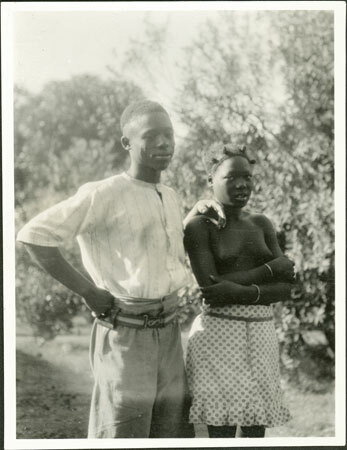 A portrait of a man in European dress (identified as Kamanga) standing with his hand the shoulder of his wife, Nalihe wiri Bamina (i.e. a daughter of Bamina). Nalihe was Kamanga's second wife, who he married in the district of Bagomoro during E-P's fieldwork. Notes on print/mount - "52/4 +10 EPA629"
Notes on card mount m/s pencil - "SS (RCS?) mid LHS + fading? 8.89""
Morton, Chris. "Zande husband and wife" Southern Sudan Project (in development). 03 Jan. 2006. Pitt Rivers Museum. <http://southernsudan.prm.ox.ac.uk/details/1998.341.629.2/>.